From China to Korea, South East Asia, and eventually Europe, stoneware and porcelain celadon ceramic wares have entranced the world. Currently live in our Asian art sales closing October 25 and 26, 2017 are many Celadon wares, ranging from Korean Goryeo Dynasty (918-1392) pieces and Jin (265-420) to Ming Dynasty (1368-1644) Chinese wares. 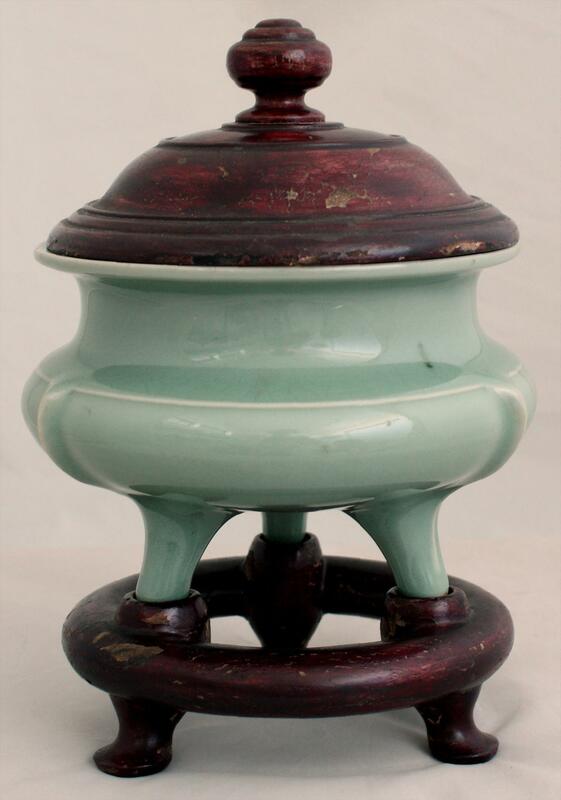 The best known of all celadon ceramic wares were produced in China in and around Zhejiang Province. Today Zhejiang province is well known as the host to Alibaba and a multitude of billionaires including China’s most wealthy person, Jack Ma (Ma Yun). The desirability of this province comes as no surprise when we examine the past of this region, as Zhejiang has experienced incredible wealth and artistry for thousands of years. Neolithic cultures flourished here as early as 6,000 BC producing beautiful jade objects, simple in nature and pure in color. Attempting to reproduce the beautiful green jade color in ceramic form there were several kilns that became known for these wares in and around Zhejiang. 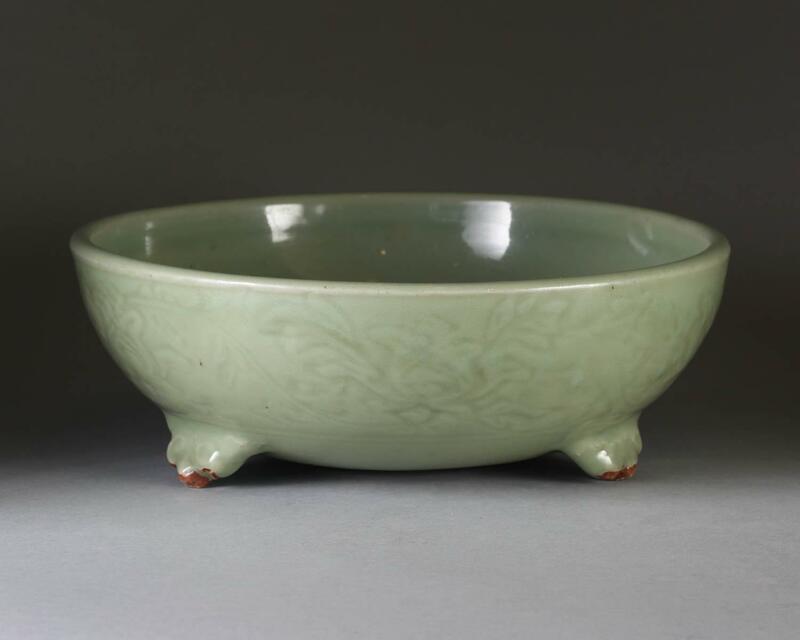 The tradition of celadon wares arguably began with the early Yue wares over 2,000 years ago. 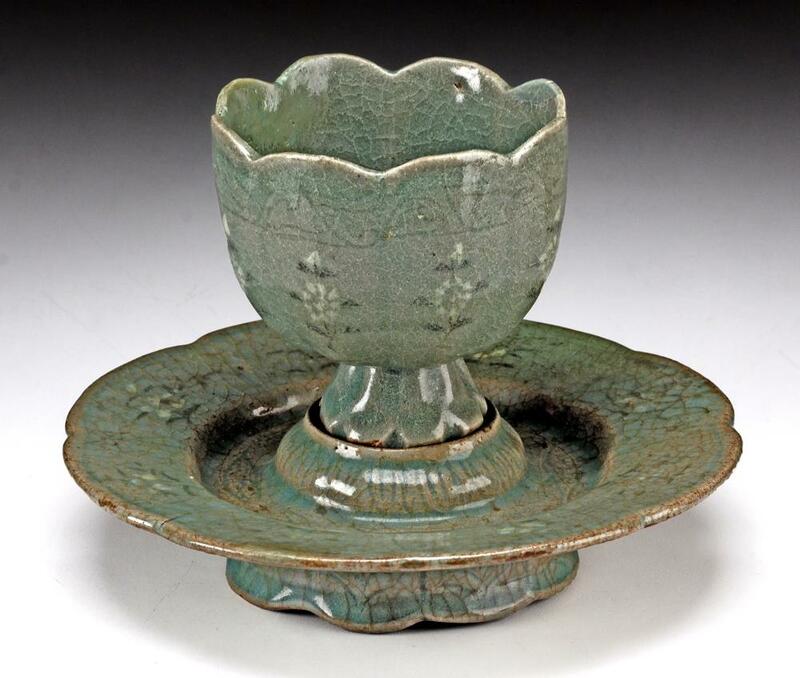 A dark earthen celadon, most often produced with molds or having shallow carving. While celadon may have been produced 2,000 years ago, we do not associate the word celadon with the dark earthen tones in Yue wares because from the Tang to Ming Dynasties, Longquan, a city in Zhejiang province, became the major production center for celadon ceramics. The workshops there produced pieces that traveled around the world and were emulated and recreated in many international pottery centers, starting with those in Korea, Japan, and South-East Asia during the Tang Dynasty (618-907) and later in European kilns. It was in Longquan that celadon ceramic wares truly came into their own. During the Song and Yuan Dynasties, these kilns produced stoneware pieces of incredible beauty that for over a thousand years have been treasured, admired, and handled by the most discerning collectors. 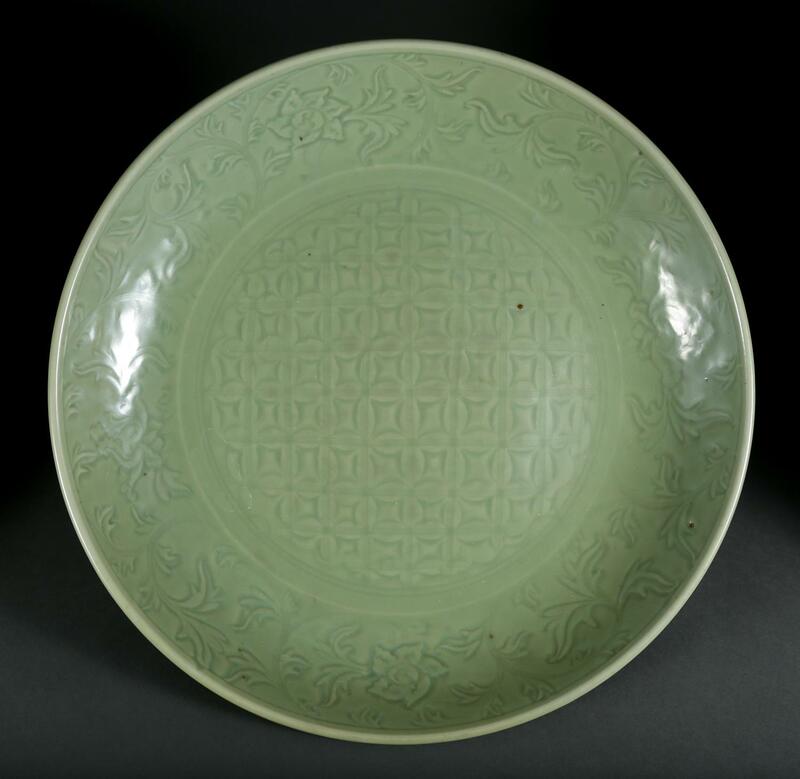 The celadon color ranges from an almost translucent blue to a much more earthen green. The glaze is thick, pooling in the molded or carved recessed areas, thick with bubbles giving a cloudy appearance, and having a satisfying texture similar to the feeling of the finest sandpaper or thick velvet. Many of these Song Dynasty pieces have lasted through the ages but often they have received some form of damage. Currently for sale is this impressive sized Ming charger. 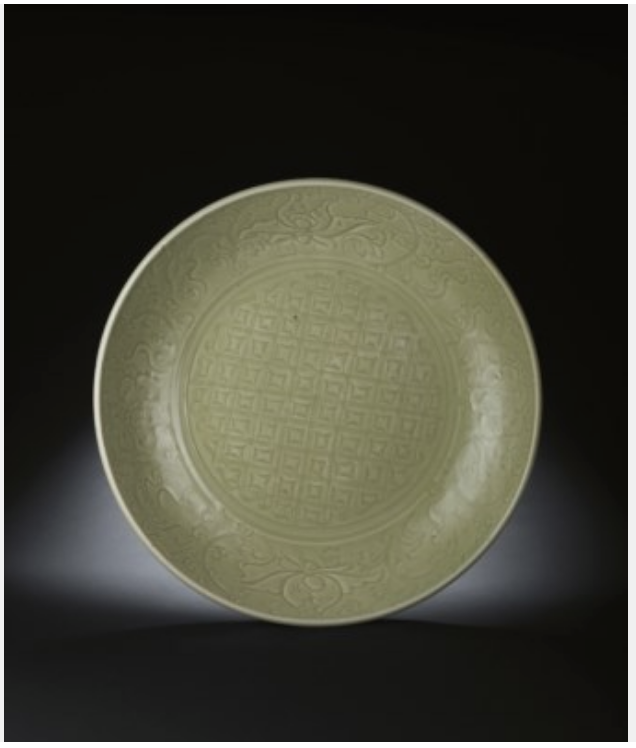 During the Ming Dynasty (1368-1644) the traditions of celadon wares were continued and this dish is a wonderful example of the workmanship of that time. With an even decoration and impressively level potting it is a powerful piece. The ornately carved stand upon which it rests dates to the 19th century and is a testament to the value that this object’s previous owner placed upon it. What is equally impressive about this charger is its condition and provenance: Undamaged and with an irrefutable provenance including an early photograph and a receipt from 1970. This dish is live now, starting at $15,000 and will sell October 25, 2017. 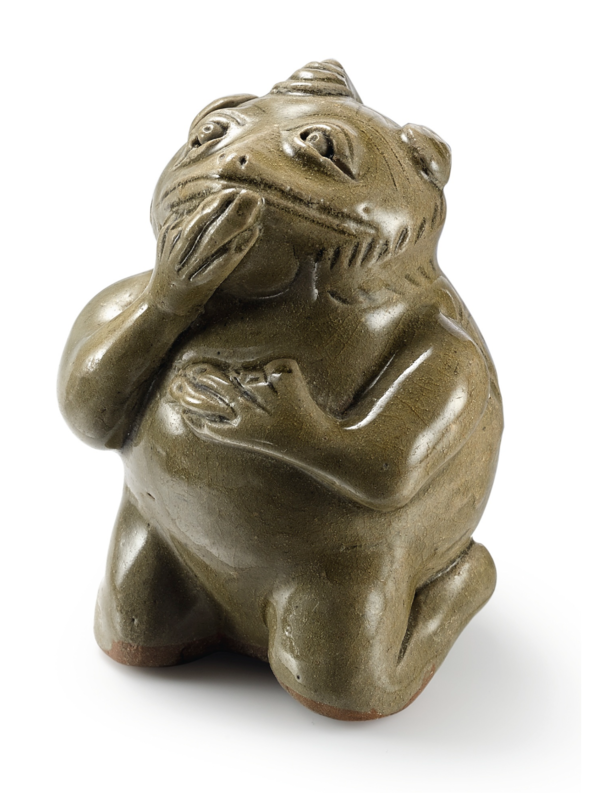 A comparable item with unlisted provenance sold at Christie’s for over $54,000. This charger is in nearly perfect condition and it can be said that we are truly seeing the ceramic piece as it was seen 600 to 500 years ago. Did you know: Today we know these wares as Longquan, the name of the city in which these celadon ceramic wares were produced. With the end of the Sui Dynasty the first emperor of the Tang Dynasty rose to power in 618 AD; he was named Li Yuan. The city was previously called LongYuan and in deference to the new Tang Emperor changed its name to LongQuan, its being disrespectful to use the emperor’s name. It is for this reason that we do not know these wares as Longyuan but rather as Longquan.